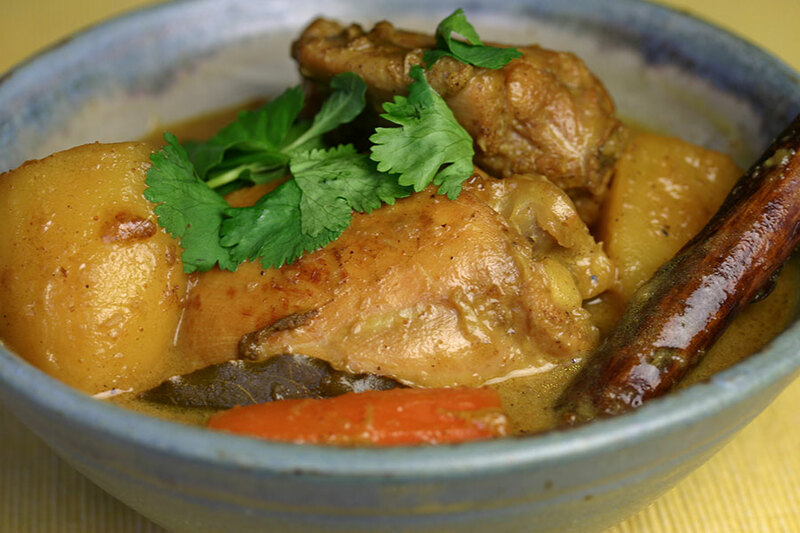 Cari ga, or Vietnamese chicken curry, is almost a chicken stew. With its familiar vegetable trio of carrot, potato and onion, it’s hearty enough to serve on its own, with maybe a hunk of baguette to soak up the sauce. The original recipe comes from Madhur Jaffrey’s Ultimate Curry Bible. Having looked at a number of other cari ga recipes, hers was the only one that included cinnamon. I’m with Madhur on this – I love the sweet warmth it brings to the sauce. Rub half the curry powder all over the surface of the chicken pieces. Set aside. In a mini-chopper, blend the remaining curry powder, shallots, lemongrass, ginger, garlic and chillies with a few tablespoons of water to make a paste. Heat the oil in a large, deep pan with a lid, and add the cinnamon stick and lime leaves. Add the onion and fry until softened. Add the tomatoes and fry a few minutes more. Add the chicken pieces and cook a couple of minutes on each side. Cover, turn the heat to medium-low and cook for 7-8 minutes more, stirring occasionally. Add the potatoes, carrots, fish sauce, sugar and a cup (250ml) of water. Bring to a boil then cover and turn the heat to low. Simmer for half an hour, then add salt to taste. Add the coconut milk, and stir and cook uncovered for another five minutes. I’ve never seen anything like this- but it sounds tasty! If you’re interested, I’d love for you to share a post at the a blog link up I’m hosting today. All you need is a URL of a post you’d like to contribute. It’s a great little circle of bloggers! The spelling of name is wrong actually name is Ca Ri Ga.